Rand McNally is a leader in the production of printed maps and atlases. The company keeps its product selection focused and specialized on maps and atlases, and the primary product lines for Rand McNally are its printed atlases. Available atlases include those that cover the United States and Canada, with an overview of Mexico. They are useful to the typical business traveler or vacationer on a road trip. These atlases also contain information on road construction by state, tourist attractions and other geographical facts about the area being traveled. For the professional, over-the-road trucker, motor carrier atlases are available. These are detailed maps, state by state, of roadways, fuel stops and all the information that a professional driver needs to know on his or her route. These atlases are spiral bound and laminated to handle frequent use. For the vacation traveler, atlases are available with a wealth of information about US states, counties, cities, tourist spots, camp grounds, trails, restaurants, and all the things that one might want to connect with while on the road. Rand McNally products are well-used by avid road-trippers. World atlases are also available with information about each continent and numerous countries. Besides the detailed maps available in the bound atlases, various fold-out maps are available for a number of areas. These maps are available in various sizes. They can be folded up and carried in the pocket or unfolded to place on a wall, and they are available for every state in the United States. They contain mileage information and location charts to help find a city or town. Maps are also available for various countries throughout the world. Road information, major landmarks and useful details for traveling in an unfamiliar country are all noted. Large maps are available to hang on the wall. These have not been folded and may be laminated and mounted in a frame for added protection. Wall maps come in various sizes to accommodate the home or office. They are available in a classic look (warm tones, much like an antique map), traditional look (blue oceans) and with political boundary information. Wall maps of the world are available with the above features. Maps of the United States are available with the above features and also county information. A special type of wall map is available for home or business use that lets one use pins to indicate where someone has traveled. This gives the consumer a way to track a vacation path or indicate a business territory. Custom wall maps may be created to cover a particular city, county or neighborhood. These maps are useful for schools or local organizations and businesses to focus on a specific portion of geography. These wall maps may show service areas, delivery routes, real estate and any other useful information that can be represented on a map. Rand McNally has produced maps for over 150 years covering much of the globe. The company continues to add to its map-making history as it adds new features and styles. 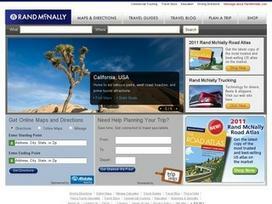 Share what you think about Rand McNally, and your favorite ways to save there! As an RVer, I've used their road maps and atlases for years. Now I use their GPS navigation system. So good.